In this module are congregated diverse configurations linked to the exhibition format of the form application. Orientation - Orientation of the registers in the form, can be: unique register and multiple registers. Single Record: Edit/Add a register per time. Multiple Records: Multiple records can be edited at a time. See the image below each row represents a record in the table. Editable Grid: Some registers can be edited per time. See in the image below that each line represents a register in the table. Editable Grid View: A record can be edited only if open the edit box of a record. See the image below each row represents a record in the table. Friendly URL - This field allow you to change the URL that will be called by the application, allowed characters are the same available on URLs: a-z, A-Z, 0-9, -_. This option can also be changed on the home screen, on the Friendly URL column at the applications list. Pagination (not available to Single Record) - Define how to display the records in the screen. All records in the screen or using pagination. Lines per page (not available to Single Record) - Amount of lines of registers per page. Lines for inclusion (Multiple Records)- Amount of registers shown for inclusion. Horizontal Alignment - Allow to define the alignment of the application in the page. Margins - Define the magins of the form(right, left, top, bottom) in pixels. Table Width - This parameter define the table width of the application. Table Width Unit - Measurement unit	used to the table width defined in the previous item. Percentage, pixel or automatic. Table Columns - This parameter define the table columns width. Use Modal (Editable Grid View) - Define if the update mode of the Editable Grid (view) will open in a modal window. Modal Width (Editable Grid View) - Define the modal window width, if the "use modal" option is enabled. Modal Height (Editable Grid View) - Define the modal window height, if the "use modal" option is enabled. Automatic tab - Advance the focus to the next field after completing the maximum number of characters allowed in the field. Highlight Text upon focus - Highlight field contents when the field receives focus. Use Enter to tab - Use the "Enter" key to tab from one field to the next field. 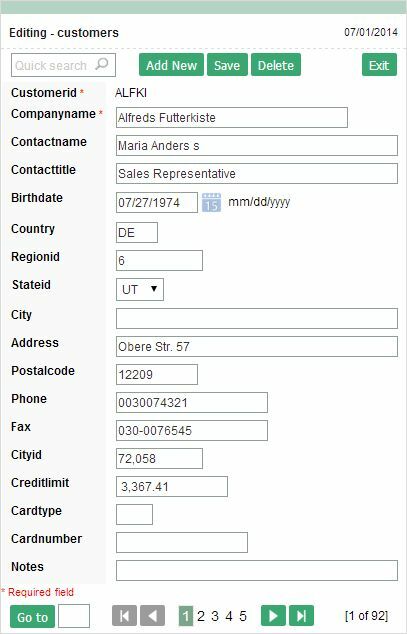 Focus on field with error - Focus on the first field with an error when submiting the form. If any validation errors occur, the focus will advance to the first field with an error.